With low commission rates and low fees, SogoTrade can lower your trading costs. 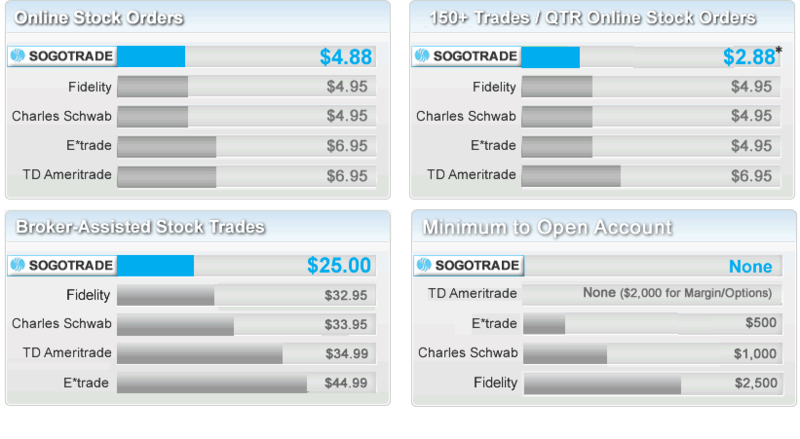 Compare our commission rates, open an account and see why sophisticated traders and smart investors choose SogoTrade. Not active enough to qualify for $2.88 stock trades? No problem. Buy SogoTrade's Prepaid Commission Packages to lower your rate to $3.88 or even $2.88 ! Prices for competitors were obtained on 12/28, 2018. and are believed to be accurate, but not guaranteed. Some of the firms listed above may reduce or waive commissions or fees, depending on account activity or total account value.